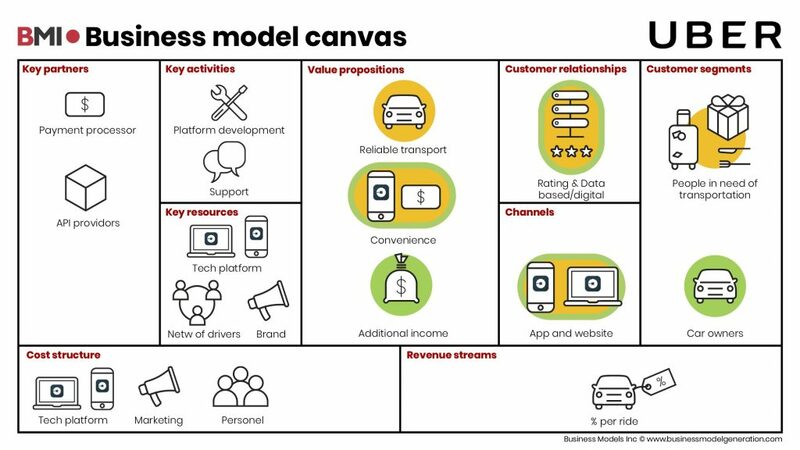 Uber - Business Models Inc.
That Uber has put its stamp on the taxi industry is without discussion. It has created a shift in the way we think about personal transportation. Whatever the future of Uber will be, one thing is obvious: we are never going back to the old situation. Of course, Uber still has its challenges with lawsuits, expanding to new cities (chicken and egg) and trust/safety issues. But with a presence in over 600 cities, 1 million rides on average a day, over 50 million users, 7 million registered drivers, sufficient funding coming in (last was $22 billion in December 2017) and a company valuation of over $70 billion we can state that Uber is very successful. The main reason for that is that Uber has an exponential business model. Uber’s business model is exponential in many ways. The most important one of them all is that they solve a problem for the many. Getting from A to B without your own transport is a worldwide ‘job to be done’, it exists almost everywhere. Next to that, one of the most relevant changing consumer needs we see is the longing for no hassle and easy services. Combine those two and link it to the ‘old way’ of taxi transportation and you see a worldwide problem to solve. Uber addresses the hassle with ordering a taxi (in a foreign language), lack of information, paying, insecurity what to tip, if the taxi driver can be trusted, if he drives the optimal route and other irritations. And that’s only one of their customer segments. As they are a multisided platform, they connect two segments. They also solve problems of the other segment, car owners who want to make extra money with driving. Uber makes it easy to make that happen. Another very important element is that their value proposition is based on an information-based service. It is all about the data/information and the technical platform to distribute that data, and that is extremely scaleable. The Uber app and the technical platform behind it are easy to duplicate to new (geographical) markets. With Uber, no adjustments are needed most of the time (in some countries you can also pay with cash, like in India). Combine that information-based service with a digital channel which is available worldwide, the IOS and Android app stores, and you have a very easy way to unlock your service to a broad customer base. Uber also creates a community of fans. There are two important reasons why this helps them in creating an exponential business model. One, as they are a love-brand and people are very enthusiastic about the service, they get free marketing due to positive word of mouth and ambassadorship. Two, users (drivers and the one being driven) are important contributors to the success and efficiency of the platform by giving feedback and ratings. Uber is ‘outsourcing’ that important element of the platform to its users. That is very scaleable, and free as well. Lean processes are another important element, it helps them to easily expand to new markets/cities. They have playbooks for roll-outs and, as said, the platform requires minimal adjustments to fit the new markets. On top of that, they work together with some important key-partners which make expansion relatively easy. They make use of Google Maps for example which gives them easy access to worldwide mapping, key in their app, and they use Adyen to process all their global payments. Of course, there are also non-exponential elements to the Uber business model. In the case of Uber that mainly has to do with people. As they need to have an office in every city they operate in, e.g. for customer support and driver acquisition, that decreases the ease of scaling. Next, to that, they need to boost brand awareness in the new city and they need to create a minimum base of drivers before they go live. You might think that Uber is in the taxi business, but they are in the transport business as they also offer helicopter and boat transports. But not only personal transport. With Uber Eats they offer transport of food, serving three segments: (bike)drivers, restaurants and users. And they are expanding their business into the professional transportation, with UberCargo. Same concept, same value proposition, different customer segments. The interesting thing here is that they have a very strong base to make an even bigger business model shift. Their key resources are 1) an easy to use technical platform which connects offer and demand, 2) a huge customer base and 3) a strong brand worldwide. This provides them with the opportunity to relatively easily expand to other areas of value. So, stay tuned. Do you want to learn more about Exponential Business Models, join our workshop in Amsterdam – November 29.